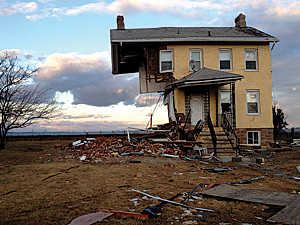 Superstorm Sandy impacted the coasts of New York and New Jersey in a fashion not seen since the 1903 Vagabond Hurricane. Storm surges of more than eight feet, coupled with more than 11 inches of rainfall and wind speeds nearing 90 mph damaged or destroyed more than 72,000 homes and businesses across the coast of New Jersey. 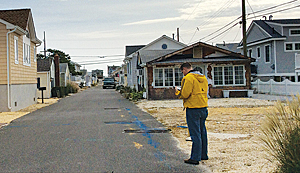 In the blink of an eye, decades of Jersey Shore history were washed out to sea by Sandy's wrath, leaving a swath of destruction from Sandy Hook south to Downe Township. In addition, coordination between multiple offline field teams and the upkeep of collection units was difficult. HVRI's field teams are composed of 6 to 14 researchers who collect data concurrently across the expansive study region. Methods for allocating work and evaluating data collection progress were inefficient and sometimes resulted in miscommunication, unsystematic routing, duplication of work, and inconsistent or incomplete recovery data. Given these challenges, HVRI identified the need for a coordinated approach to field data collection. The institute believed that Esri's Collector for ArcGIS app presented an integrated mobile solution that would help reduce the inefficiencies of disconnected data collection. As a cloud-based service facilitated through ArcGIS Online, the Collector app allows multiple users to simultaneously collect and send data to an online feature service that is capable of storing and displaying spatial, photographic, and tabular (form/attribute) data in one location. HVRI's initial development of the Collector dataset took just seven days from inception to field deployment. To quickly familiarize the staff with the new technology and ensure proper implementation, the HVRI designed a local pilot dataset and conducted two field training sessions that let staff practice data collection and pose questions. These sessions not only provided an opportunity to train HVRI staff in the use of the Collector app but also created an opportunity to uncover small issues with the feature service and make appropriate edits before deploying a production Collector app in the field. Using Collector for mobile data collection significantly improved the efficiency of HVRI field personnel. Instead of carrying multiple pieces of equipment into the field, staff members needed only an iPad with a mobile data connection and GPS capability, which served as an integrated data entry device that also supplied photography and navigation. In rural areas of the study region, where data connections were unreliable, field units used Collector's disconnected editing to download maps to the iPad and work offline and later synced the map when a connection became available.